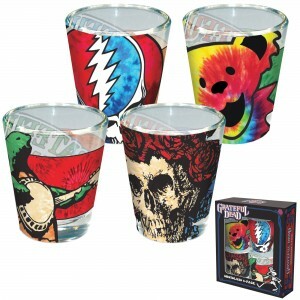 This set of 4 Grateful Dead graphic shot glasses features 4 classic GD icons: Bertha, a Dancing Bear, a Terrapin Turtle, and a Steal Your Face. This set of 4 shot glasses is perfect for the glassware collector or memorabilia collector in your life. Officially licensed Grateful Dead Merchandise.